CULINARIA Query: Can We Re-Set the Family Table? Join SoFAB Institute and the Food Studies Program at The New School for the next Culinaria Query of 2014 in New York City. It is an increasingly established opinion that as a society we have moved from the cultural practice of gathering around the table for a family meal to munching on the go, in the car, on the hoof, even at the gym, and grazing all day instead of, well, eating. This cultural shift has been identified as damaging for both family dynamics and our waistlines. Does this opinion reflect actual historical and social developments? Given the realities of modern life, we cannot return to the idealized, and largely imagined, family life depicted in the situation comedies of 1950s television. However, are family meals still important to society in general and the healthy functioning of individual families? Can food and its preparation, service, and consumption still be considered as a viable way not only of passing on family values and traditions but of communicating civilization as well? This talk will be moderated by Elizabeth M. Williams, JD, President of the SoFAB Institute with Ava Chin, Associate Professor of Creative Writing and Journalism at City University of New York; Krishnendu Ray, an Associate Professor and Chair of the Department of Nutrition, Food Studies and Public Health at NYU and author of The Migrant's Table: Meals and Memories in Bengali-America Households; Meryl Rosofsky, MD, writer and Adjunct Professor in the Department of Nutrition, Food Studies and Public Health at New York University; and Fabio Parasecoli, Associate Professor and co-chair, New School Food Studies Program. The series is produced under the aegis of Culinaria, a scholarly monograph series published by the Culinaria Policy Center, a division of the SoFAB Institute in partnership with the Tulane University Law School. Culinaria e-publishes peer-reviewed articles on law, policy, and cultural issues involving food and drink in a timely manner, absent the delays common to traditional academic journals. Many thanks to Domino Foods, Inc., the National Title Sponsor of 2014 Culinaria Query & Lecture Series, for supporting this exciting series. 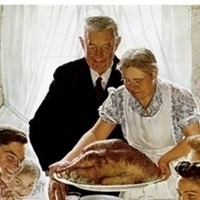 Image: Norman Rockwell, Freedom from Want: The Thanksgiving Picture, 1941-43.